Could Comcast Corporation (NASDAQ:CMCSA) soon be a buy for investors? 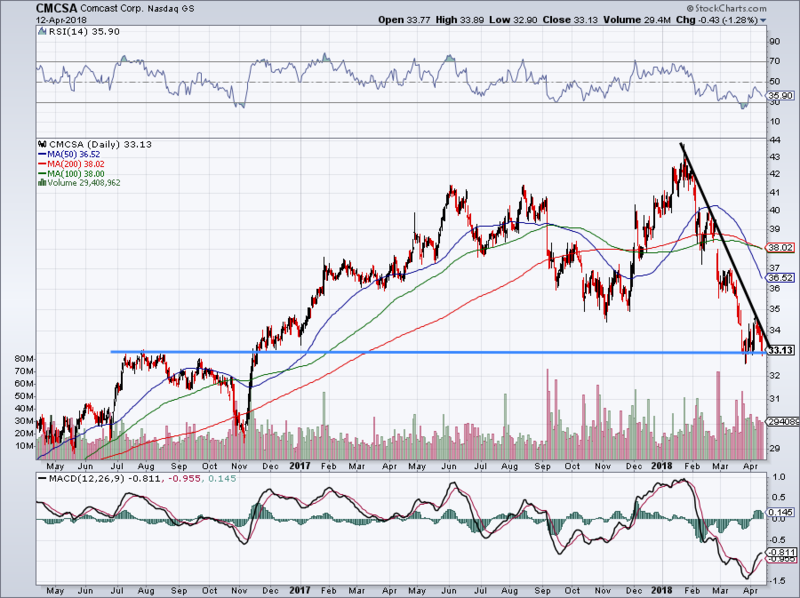 In fact, it may be a buy right now given the selloff that Comcast stock has suffered. Over the last month, CMCSA is down 10.8% compared to the S&P 500’s decline of 4.6%. Further, Comcast’s year-to-date performance shows a 17.3% decline vs. a decline of just 31 basis points for the S&P 500. Why such a stark difference? Many may pin it on the company’s recent itch for M&A. Not long ago, Walt Disney Co (NYSE:DIS) announced its plans to buy Twenty-First Century Fox Inc (NASDAQ:FOX, NASDAQ:FOXA) for more than $50 billion. FOXA is looking to close on its acquisition for Sky, which it already owns 39% of. According to U.K. regulators, Disney will have to submit an offer to buy the remaining 61% stake should it acquire Fox before Fox acquires the rest of Sky. And making this all the more complex? Comcast debated a rival bid for Fox assets following Disney’s offer to buy most of Fox, then submitted a bid for Sky. So the M&A landscape is really quite murky in the media industry. It basically boils down to all the big fish wanting to buy the smaller fish. At its highs in early January, Comcast stock was changing hands near $43. Now about $10 per share below that mark, we are now almost 25% off of those highs. Despite the murky M&A outlook, let’s look at what CMCSA has going for it in the first place. Analysts expect solid sales growth this year from Comcast, modeling for 6.1% growth in 2018. In the following year, estimates call for lower but still respectable growth of 2.4%. On the earnings front, consensus expectations call for almost 21% growth in 2018 and 10% growth in 2019. For this, we’re paying just 13.2 times 2018 earnings and just 12 times forward earnings estimates. I wouldn’t say that’s dirt cheap, but it is pretty darn cheap when compared to most stocks. 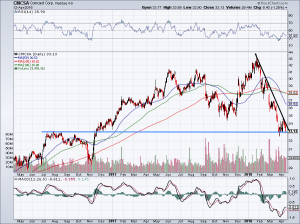 Worth noting is that Comcast stock also pays out a 2.2% dividend yield. There’s also the added kicker of Sky. Should Comcast somehow pry Sky away from the Disney/Fox duo in the bidding process, it would be a great strategic fit for Comcast. It would also help boost its EBITDA, according to Wells Fargo analyst Marci Ryvicker, who argues that Comcast would likely win in a bidding war. Other analysts have recently flipped to a buy rating on CMCSA stock, with Buckingham analysts saying a successful acquisition of Sky could act as the “major building block for a global streaming business.” Analysts at MoffettNathanson have a similar take, arguing that Comcast’s potential platform could rival that of Netflix, Inc. (NASDAQ:NFLX). Bulls can justify buying in two spots, one of which is right now. Shares are sitting right on a vital level of support (blue line), which was previous resistance in the second half of 2016. This sets up an attractive risk/reward. However, it’s also hitting a downtrend line of resistance (black line). Should this downtrend line pressure CMCSA stock below support, a decline down to $30 is in the cards based on previous support levels. Bears can short CMCSA on a close below $30 and also have an attractive risk/reward. However, I should point out that I find this downtrend line to be too sharp and ultimately unsustainable. It may stay in place now, but it will ultimately fail. It’s just a matter of when. That gives bulls a second chance to buy Comcast stock if they choose to avoid it right now. A break through this downtrend line would be a bullish move and one that bulls may want to buy — particularly if CMCSA stock is above $30. Bret Kenwell is the manager and author of Future Blue Chips and is on Twitter @BretKenwell. As of this writing, Bret Kenwell held a position in DIS. Article printed from InvestorPlace Media, https://investorplace.com/2018/04/comcast-stock-no-brainer/.